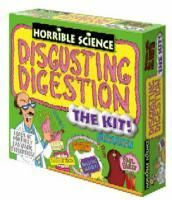 Find out all the gross things our body does to our food with the Horrible Science Disgusting Digestion kit! Get all the facts from the top-secret Lab Notebook, then try out the experiments. Squish some prechewed food in a fake stomach, check out a bursting bladder, see how kidneys work by filtering some mock blood yourself, and more! Get disgustingly scientific with Horrible Science Toys!